There’s little faster than fish for any meal any time and what’s more heart-loving than salmon? This sumptuous special, however, includes a silky-smooth garlicky broccoli mash which does definitely extend the cooking time a wee bit. Still, it’s all pretty snappy like this: A pot of water boiled. Veg cooked/pureed. Another veg grilled or oven roasted and tossed with citrus. Fish in a very hot pan topped with a frisky fresh salsa of minced green onions (scallions), parsley, and tomatoes. See? This meal does not take a really long time to cook, but it’s best to begin with the broccoli mash, as it takes the most time and the fish is seared very quickly. I like to serve it with orange asparagus and include the recipe below. Both the mash and the asparagus could be made a day ahead and then warmed while you cook the salmon. Do warm your plates/bowls ahead of time in a 200 degree F oven. After the salmon has been turned in the pan, begin plating the meal. Spoon at least 1/2 cup mash across each plate or bowl and add asparagus to the side, if serving. When the salmon is done, remove fillets with tongs onto the mash and top each piece with a generous spoonful of scallion pesto. Serve hot immediately. *FDA temperature is 145 degrees F for safely-cooked salmon. FOR A VEGAN VERSION: Cook up a seared cauliflower steak in place of the salmon. You might also think about a broccoli-potato mash. I like these garlicky vegetables granny done as they mash more easily. To get them oh-so-soft and silky, I simmer them in a large pot of well-seasoned water until totally fork-tender. If you’d rather, you can steam or sauté/steam instead. The amounts and proportions of vegetables aren’t critical. If there’s more, you’ll add a bit extra butter. If there’s less, perhaps not so much cheese–and so on. VEGAN VERSION: Use more olive oil and skip the cheese. Great leftover or cold for a snack. In a 6-8 quart covered pot, heat 3-4 quarts of water seasoned with 1/2 teaspoon each salt and pepper over high flame. When boiling, add all of the vegetables, reduce heat to simmer, and cook until everything is very tender– 15-20 minutes. Drain well and while in colander, push out excess water with a wooden spoon or with another, smaller colander. Spoon vegetables into food processor, add red pepper, 1 tablespoon butter or oil and cheese. Process pulsing until quite smooth, adding more butter if needed. (Or mash by hand with a potato masher.) Taste and adjust seasonings. Return to pot and cover to keep warm. Reheat as needed over very low flame, stirring often. Cook’s Note: You could use 1/2 broccoli and 1/2 cauliflower. I tried it and adored it. I used yellow, orange, and red tomatoes for my scallion pesto. You might also add colored peppers if you like those. Stir together vegetables and season with just a tiny bit of olive oil. Spoon into a small bowl and set aside or refrigerate until needed. serves 4 This recipe calls for grilled asparagus, but I include instructions for oven-roasting it, too. Choose the method that suits you best. Heat grill or grill pan over medium flame. In a large bowl, toss the asparagus thoroughly with oil and sprinkle with salt and pepper. Add asparagus to the grill pan in a single layer and cook for 3 or 4 minutes on one side and then another 2 minute or so on the other. Remove back to the bowl and toss with the orange zest. Set aside until needed. Cook’s Notes: If you undercook the asparagus a bit, you leave room to warm it up later–even for a minute in the microwave. Oven-roasted asparagus: Place the oiled and seasoned asparagus on a baking sheet (parchment paper lined or lightly greased) and roast at 425 degrees F for 10 minutes. Remove and toss with orange zest. Wine: Oregon Pinot Noir or Washington state Syrah. Budget alternative: French Côtes du Rhône. Salmon deserves a full-bodied red to offset its fatty nature, but nothing too heavy like a Cabernet Sauvignon or too dry like a Chianti. White lover: California Chardonnay. Appetizer and First Course all in One: Tapenade Salad with Hot Tomatoes and Goat Cheese. Dessert: Want to bake? 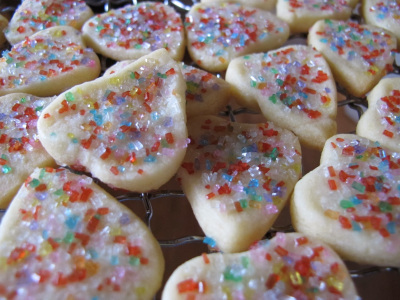 Make my Stained Glass Shortbread Hearts. Don’t want to bake? Buy some stellar chocolate ice cream and top it with sliced strawberries or marshmallow creme. 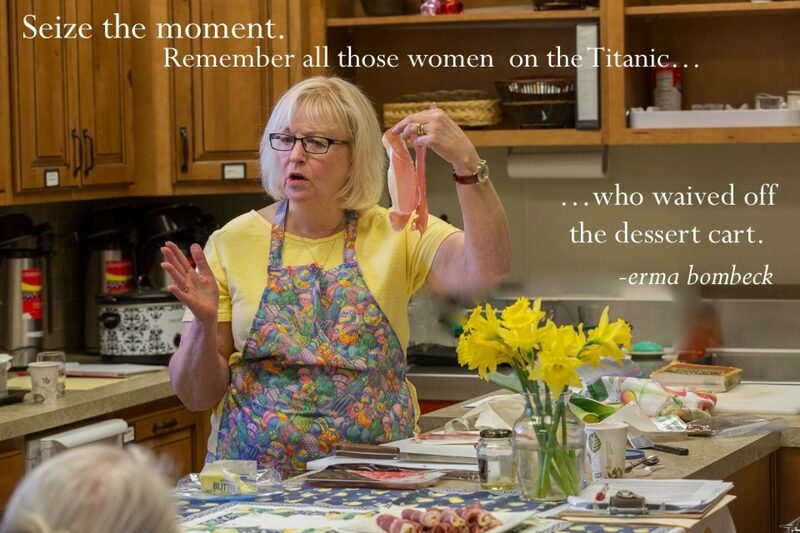 Need other ideas for Valentine’s Dinners? Check this out. Be happy and cook at home! Delicious! We will be traveling on Valentines Day, so I made this meal for us tonight. The broccoli mash was so good that I will have to make it again with other meals. I’m so glad you made it! That broccoli is addictive; I know. I love it cold for snacks or warmed up in a skillet where I cook an egg in the center. Happy Valentine’s Day!